Acts Of Kindness: States Of Grace? In our visual media-oriented world, we often encounter posters, bumper stickers or heartwarming newspaper columns that urge us to ‘Perform Random Acts Of Kindness’. When these first began to appear around 1982, it might have been in reaction to the pervasive emphasis on individual needs and rights that characterized the ‘Me Generation’. Even today, with so much news of domestic and political strife reported in that same media, it seems we still haven’t learned how to do so easily. Isn’t it strange and sad that we should need to be reminded? But given the complex duality of human nature, the need to be reminded is nothing new. Morality stories dominate the Old and New Testaments with the patriarch Abraham most commonly cited as the archetype of kindness for his hospitality to three Angels in human disguise. For this next page in An Illumination Of Blessings, I initially thought to present his story for this blessing, but for the reasons explained below, decided that the tiny tent above the Hebrew text would suffice as a meme for it. The concept of kindness was later refined and codified in the Book Of Ruth (Megillat Ruth). * Upon being told to return to her people after being widowed, Ruth, a Moabite woman insists on remaining with her widowed Israelite mother-in-law, Naomi. Her statement, “Where you go I will go, and where you stay I will stay. Your people will be my people and your God my God,” became the takeaway message that defined love, loyalty and the sincere concern for another human being’s welfare. It also painted Naomi as possibly the best mother-in-law in history! I decided to illustrate this story not only because it exemplifies our capacity for personal empathy, but because it also references the concept of ‘gleaning’; a mandated** act of kindness towards the entire community of impoverished men, widows and orphans. Gleaning is the practice of allowing these individuals to reap the corners of one’s fields and orchards following the initial harvest. 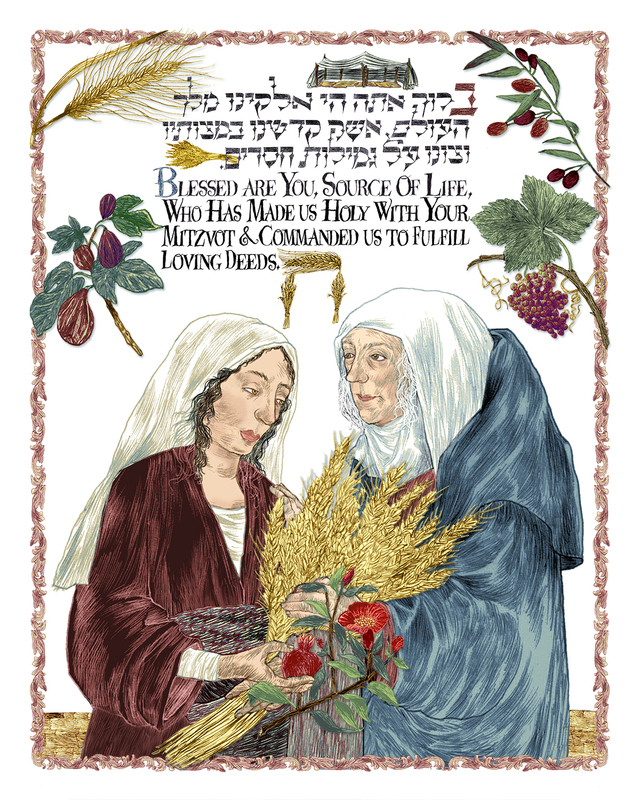 The stone wall (which represents the parameters of a field) behind Ruth and Naomi, the sprigs of barley, olives, figs and grapes are memes for this idea, as are the sheaf of wheat and pomegranate branch in Ruth’s hand. I included the pomegranate here for two reasons. First, because of its association with fertility. In the story, Ruth will enable the continuation of Naomi’s line, becoming great-grandmother of King David. Second, because of its decorative presence throughout Judaic art and history. 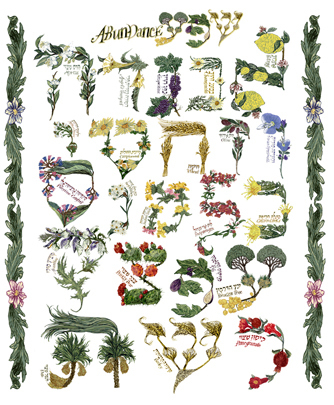 With its alleged 613 seeds, it serves as a metaphor of the 613 mitzvot or commandments that we are expected to perform throughout our lifetimes. Through performing these mitzvot, often referred to as ‘sparks’ (nitzotzot) we collectively ‘lift them up to light and repair the world’ (tikkun olam). The letter chet begins the words ‘chittah’ (wheat) and chesed which means kindness or benevolence. It suggests the limitless loving-kindness that characterizes G-d and which, by extension, suffuses all of creation. The verse from Pirke Avot 1:2 (Ethics of the Fathers) attributed to the Second century High Priest Shimon HaTzaddik (Simon The Righteous) makes this clear: “The world exists through three things: Torah, Avodah (Temple service) and acts of loving kindness.” No matter how small or insignificant these may seem when they occur, each one is ultimately a part of the larger purpose for which we were created. I am reminded here of the phrase ‘a state of grace’, which in Christian theology denotes an absence of sin in an individual. From my perspective, while Judaism dwells less on sin and redemption than on ‘kavanah’ or intention, this phrase can also describe the ideal, altruistic state of mind surrounding the performance of a mitzvah, an act of loving kindness. May you be blessed with abundant mindful opportunities to fulfill and receive acts of loving kindness and, if you’ll permit me a bit of wordplay, a ‘taste of grace’. * found in Ketuvim or the Writings volume of Torah.